Here is a gift that I gave my parents for Christmas. It is a shadowbox frame that I found at Hobby Lobby. 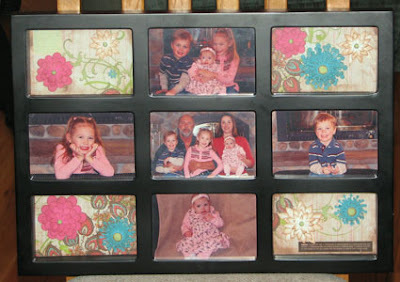 some of the places where photos can go are recessed like a shadow box. 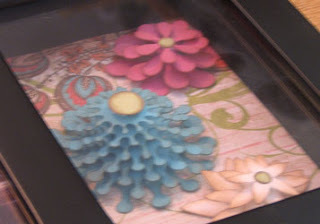 I used a tutorial that I found HERE to make the flowers. 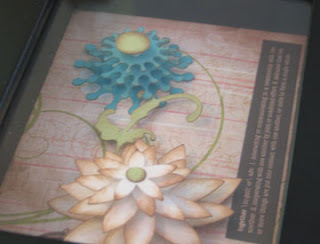 They are cut with the cricut and Accent Essentials cartridge. The vines are on the Home Accents cartridge. 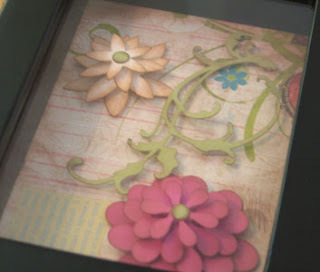 The patterned paper is out of a Prima stack I found at Michaels and the Cardstock that I cut the flowers and vines out of is from Stampin' Up!. I used some rub-ons in my stash and there was no brand on the package, so I am not sure who makes them. Sorry about the glare and blurriness in some of the photo's, I haven't quite figured out how to take good photo's through glass. Hey Amy, that project is really gorgeous ! WOW ! such intricate detailing and really love those flowers - you got them done so neatly too ! i shall go try them sometime. thanks for the inspiration ! OH, WOW, this is such beautiful work!!! 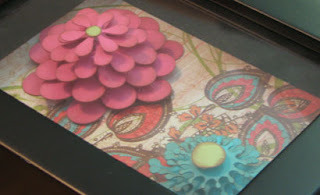 Beautiful home made cards! There is nothing more valuable then showing that someone cares and that you didn't just buy a card, sign it, shoved it in the mail. I would love to have such beautiful things. This is just beautiful - I have a bunch of frames that are waiting for me to fill them and you have inspired me to get going with that project!